Liberal vandals defaced a church sign in Indiana this week. A viewer used Report !t to send our sister station WANE pictures of the sign in front of the South Broadway Church of Christ in Huntington on Friday. 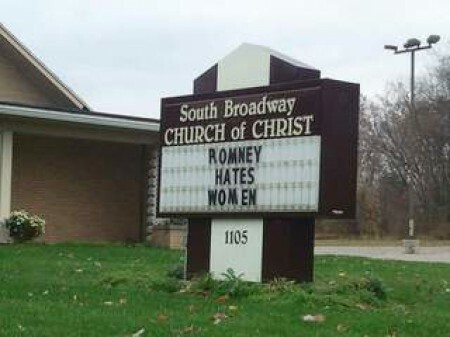 One side of the sign read “Christ voted Democrat” and the other read “Romney hates women”. Luke Jackson, the pastor of the church, said the statements on the sign were vandalism and that the authorities had been contacted. “I had about eight missed calls from church members and people from the community,” Jackson said. He said the sign must have been changed late Thursday night, but not by anyone associated with the church. The sign was still up Friday morning, but Jackson said an elder with the church came in and changed it. Jackson said the person responsible used letters that were already on the marquee, and stole the remanding letters that were used Thursday. “One community member in particular had said, ‘I don’t believe a church should be promoting anything like that in a political way,’ and I agreed 100 percent,” he said.